Even though I wore this outfit Tuesday, I'm in the same mood today. A bit of casual, a bit of sparkle is the perfect mix for a fresh start for the weekend. I don't have anything in particular planed for this weekend, just relaxing! How about you ? I am loving this entire outfit but those jeans are awesome, love the zippers on the inside! super cute the colour and the cut of the jacket. Love your coat!!! The colour is absolutely fabulous!! Looking gorgeous as always! Really LOVE that coat!! The color looks gorgeous on you! oh I didn’t know that you can be mixed up the yellow and the grey !!! You pull it out very well of course ! 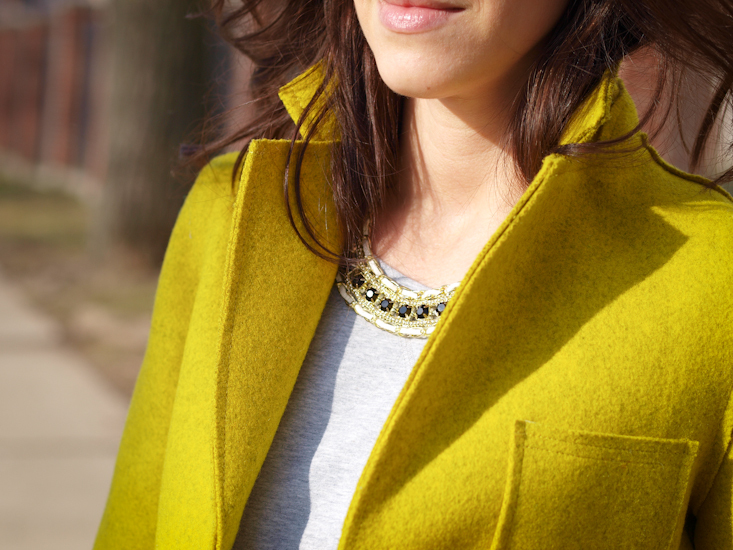 I love that coat and the necklace is so pretty! LOVE this!! That coat and bag are so perfect against your t-shirt and jeans. So effortlessly chic! I totally love this look! Love the jacket a lot! great colors, love your pans and shoes! Hi dear! Just found your blog, I really likee your style! Wanna follow each others? 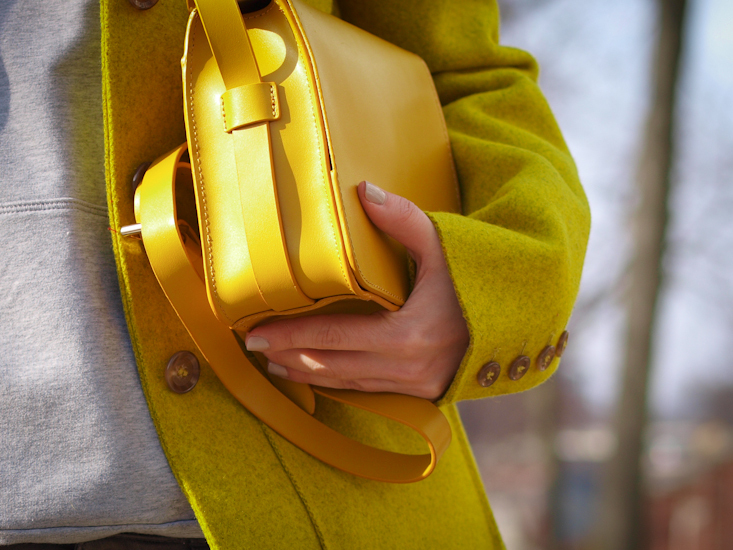 Amazed in how a full grey ensemble gets full dash with the yellow-green coat and bag! Superb! I don’t think many people can sport such bright shade of yellow so well! 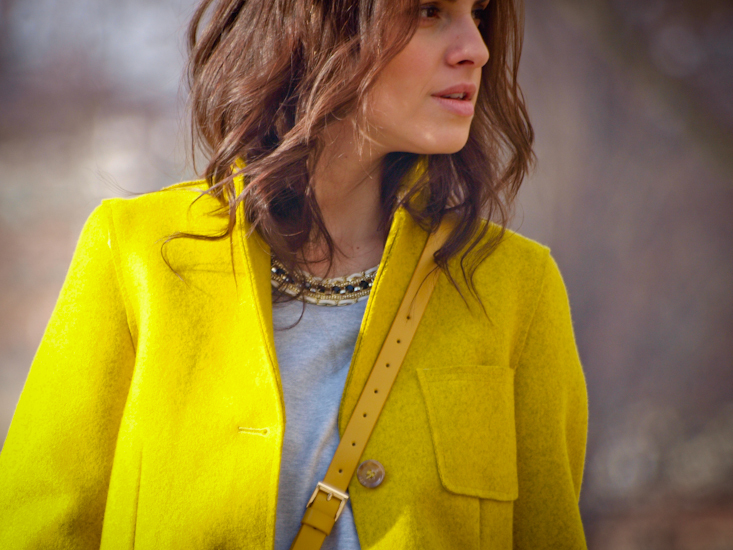 And the colour mix yellow/grey is so chic!